The purple area is the 3D printed implant and the orange is the stem cell graft. 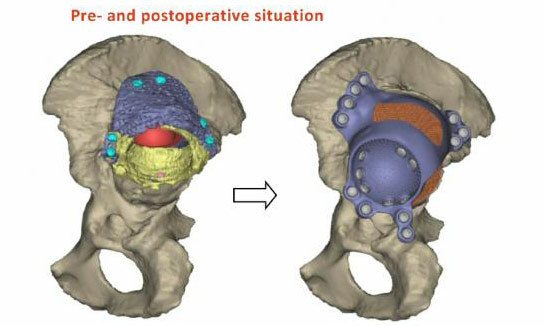 A team of researchers from the University of Southampton have completed their first hip surgery with a 3D printed implant and bone stem cell graft. The graft acts as a filler for the loss of bone. The patient’s own bone marrow cells have been added to the graft to provide a source of bone stem cells to encourage bone regeneration behind and around the implant. Southampton doctors believe this is a game changer. Douglas Dunlop, Consultant Orthopaedic Surgeon, conducted the operation at Southampton General Hospital. He says: “The benefits to the patient through this pioneering procedure are numerous. The titanium used to make the hip is more durable and has been printed to match the patient’s exact measurements – this should improve fit and could reduce the risk of having to have another surgery. Over the past decade Mr Dunlop and Professor Richard Oreffo, at the University of Southampton, have developed a translational research program to drive bone formation using patient skeletal stem cells in orthopedics. Professor Oreffo comments: “The 3D printing of the implant in titanium, from CT scans of the patient and stem cell graft is cutting edge and offers the possibility of improved outcomes for patients. Be the first to comment on "Doctors Complete Hip Surgery with 3D Printed Implant and Bone Stem Cell Graft"